When you email your advert to us at reedorganwebsite(at)gmail.com include all your details including a picture if possible, full description, location and email address. Details will be left on for up to 6 months unless renewed before the end of the period. NOTE: you must use the above e-mail address. Due to problems with lots of spam this is the ONLY address that will now work. Remember to replace the (at) with the @ sign and mail will then arrive and be answered. To see the pictures click on the "thumbnails" in the adverts - use your browser's "Back" arrow / button to get back to the advert. No responsibility can be accepted for their accuracy by the owner of this site. Rushworth & Dreaper Apollo no. 1332 ca.1936. Instrument has integral Mecvent blower, balanced swell pedal. 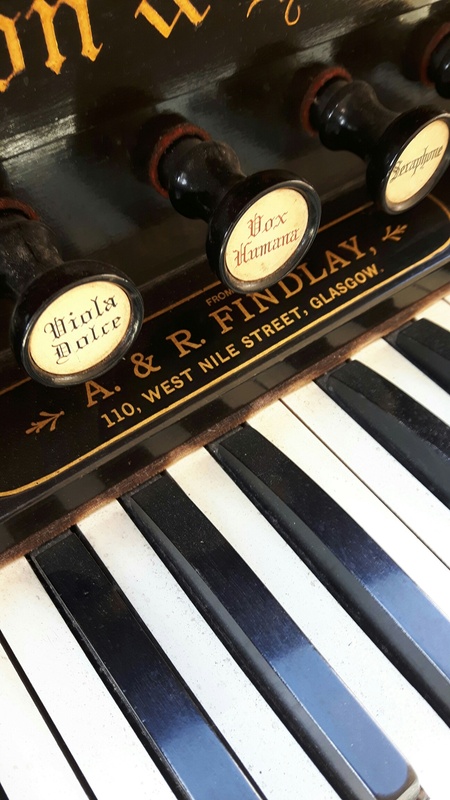 In playing order but does need restoration work to Swell suction regulator, key action and pedalboard. Is in regular use for practice and enjoyment but work commitments mean I don't have time to commit to restoring it. Blower motor has been rewound and new run capacitor fitted. 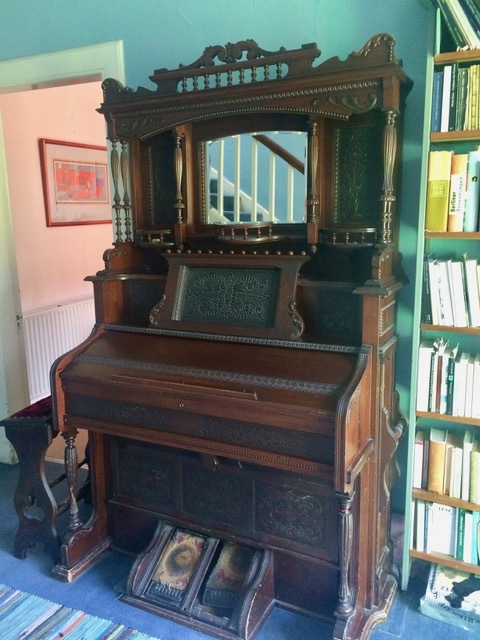 This is potentially a really nice example evoking a classic English cathedral organ. Balanced swell pedal, two combination levers each to Swell and Great. 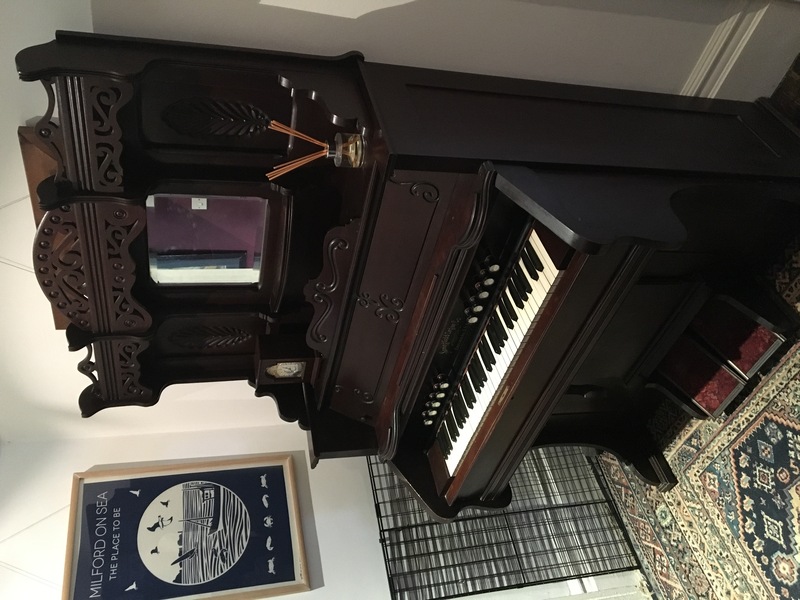 Clough and Warren Reed organ imported from Detroit, Michigan, USA. 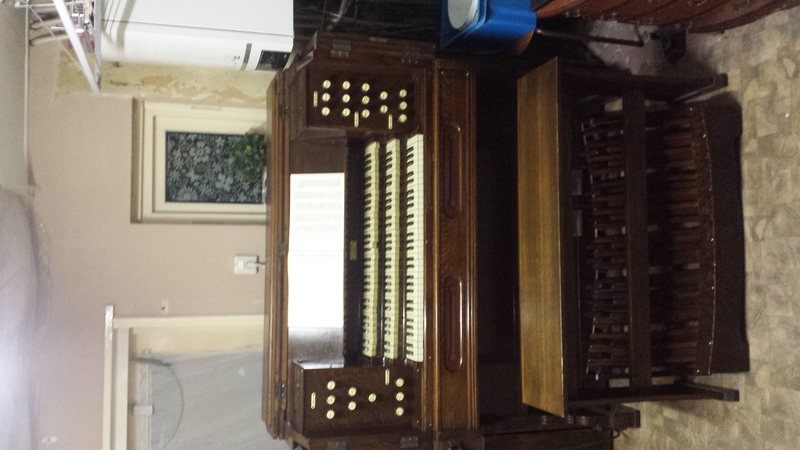 This organ has been in the family for 3 generations. It was left to me, when my Great Auntie died. Forte, Trumpet, Flute Dolce, Flute, Celeste, Clarone, Vox Angelet, Melodia, Treble Coupler. 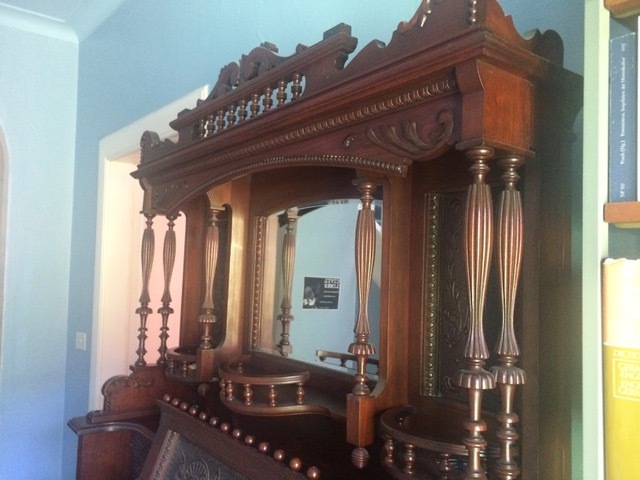 The front includes brass candle stick holders that swivel on their mounts. 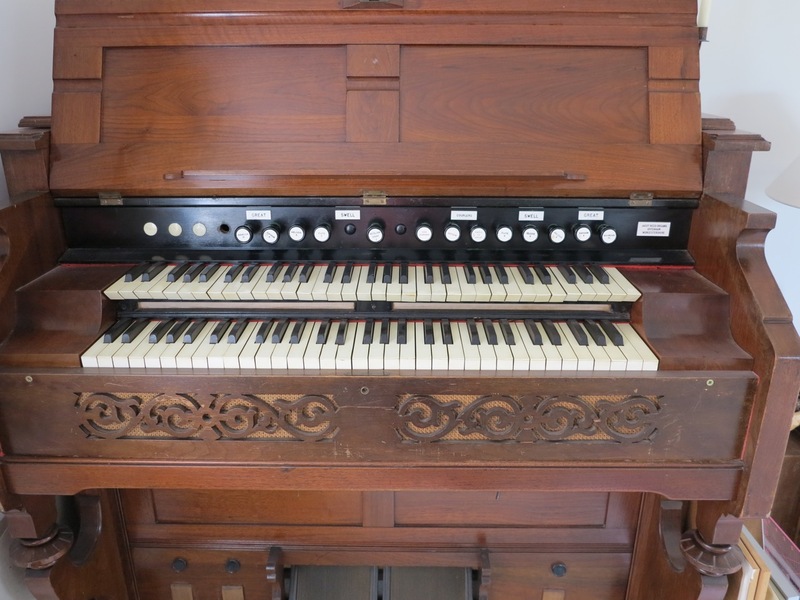 The organ all works fine, except the hessian straps that connect the pedals to the bellows have snapped, a simple fix. In fact I have some old seatbelts to use as replacement for the hessian straps. 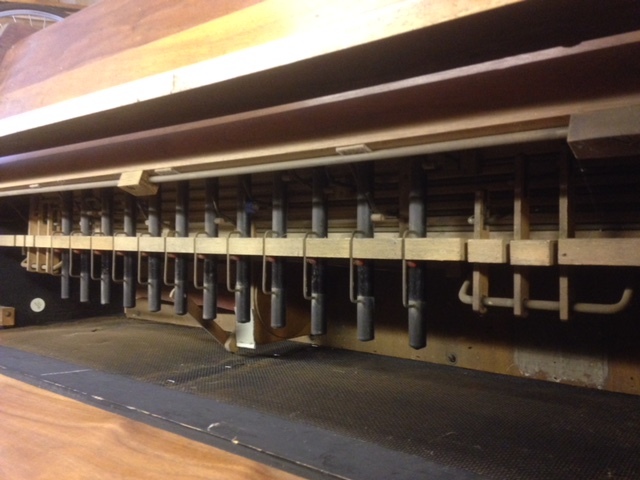 Just need to attach straps from the back of the organ with tacks/ staples. There is a stool as well. 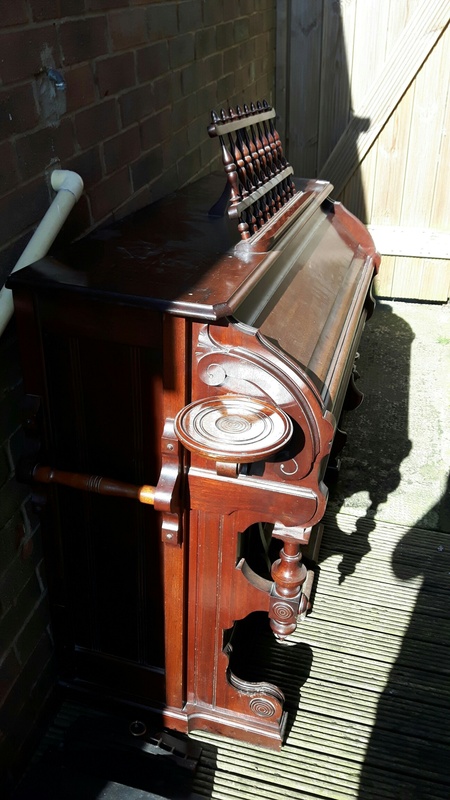 For Sale at £200, cash on collection. 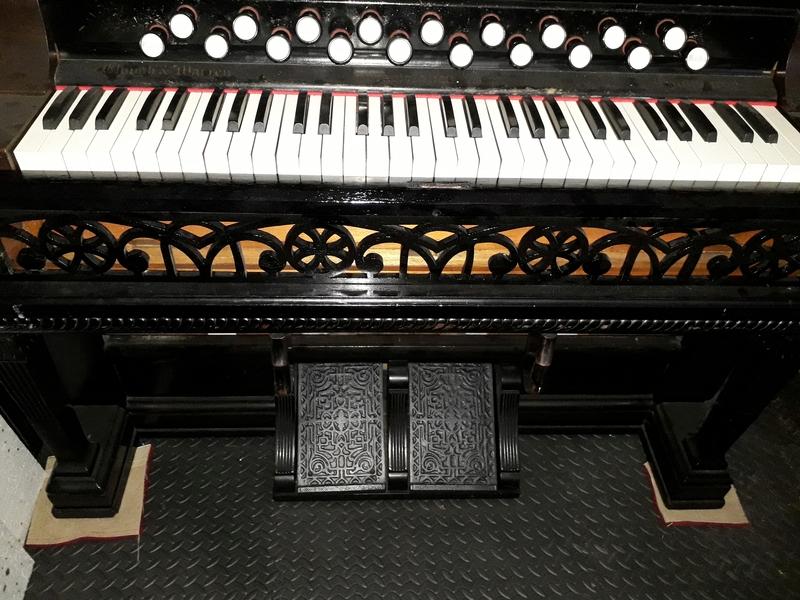 Large Clough & Warren reed organ with Scribner resonator tubes giving it an unusually smooth and rounded tone, as patented by George Scribner in 1870 (US104653). In good playing order and with minor modifications to iron out some idiosyncrasies in its original design, all of which could easily be reversed. 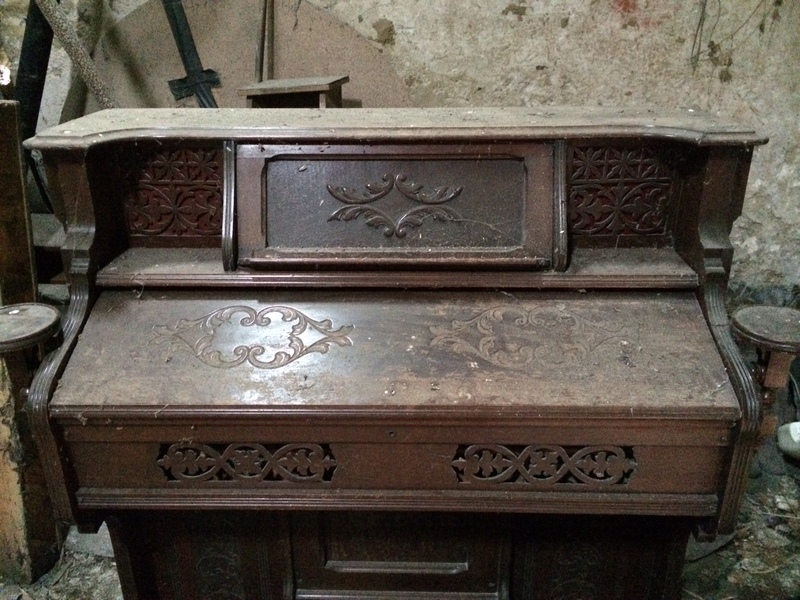 Casework still in need of further renovation, music stand badly damaged / incomplete. 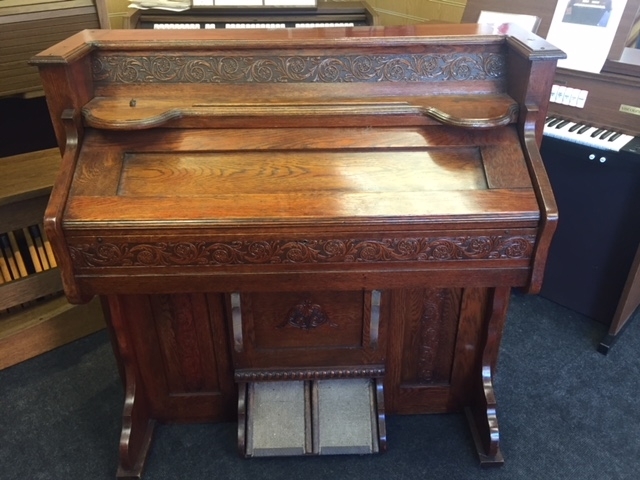 Comes with hand blowing gear as well as working foot pedals and is "chapel style" with an ornate back panel designed to be seen. Plus Full Organ and Forte knee swells. Note the depth is larger than some modern UK doorways - check your doorway widths and access route ! A rare opportunity to purchase a splendid insturment, almost the top of Clough & Warren's range. See an online copy of their 1883 catalogue. Similar to Case 5 and Action 13 with a few extras. For sale at £180, cash on collection. Located just North of Liverpool. Easy flat access and help available with loading. Note the instrument is heavy - either bring a tail lift van or several strong friends. but dry and pest free. Base unit only - no superstructure. Has to go in the next couple of months as we are selling the house. 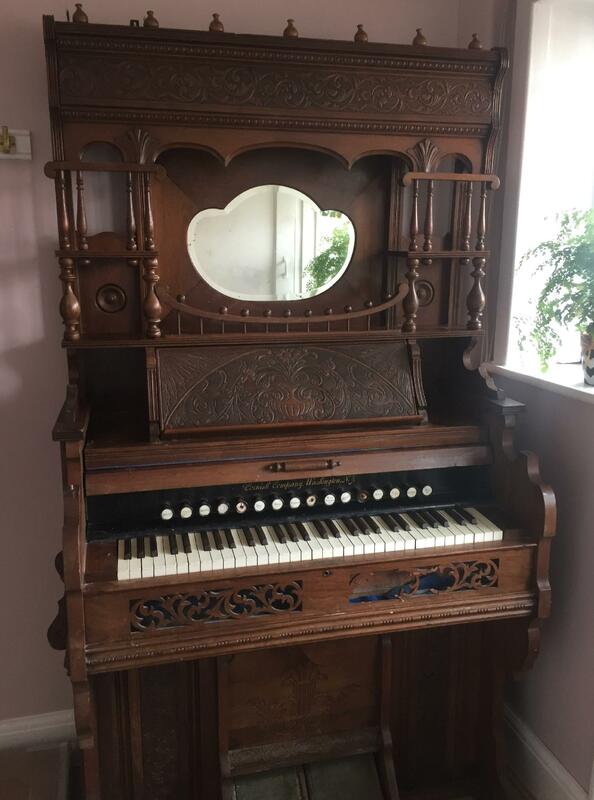 New home required for a Cramer (London) Harmonium. 45 inches wide, 39 inches high, 21 inches deep. About 50% of the stops work, so would require renovation. Would have to collect, with help, as it is heavy, and you would have to come down three steps. 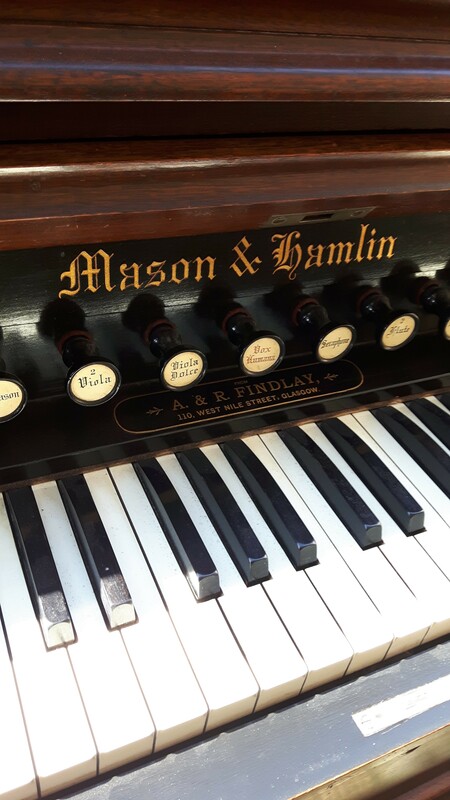 Mason and Hamlin model 45 reed organ. 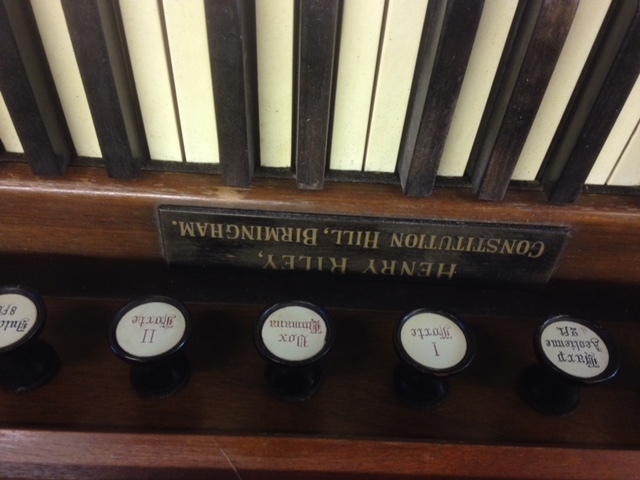 also labelled Metzler & Co American organ. 131cm wide, 60cm deep and101cm high. auto swell, 1 diapason, 2 viola, vox humana on and off (tremelo). 2 flute 1 melodia and euphonic solo. Pedals need attention and 2 keys stuck. 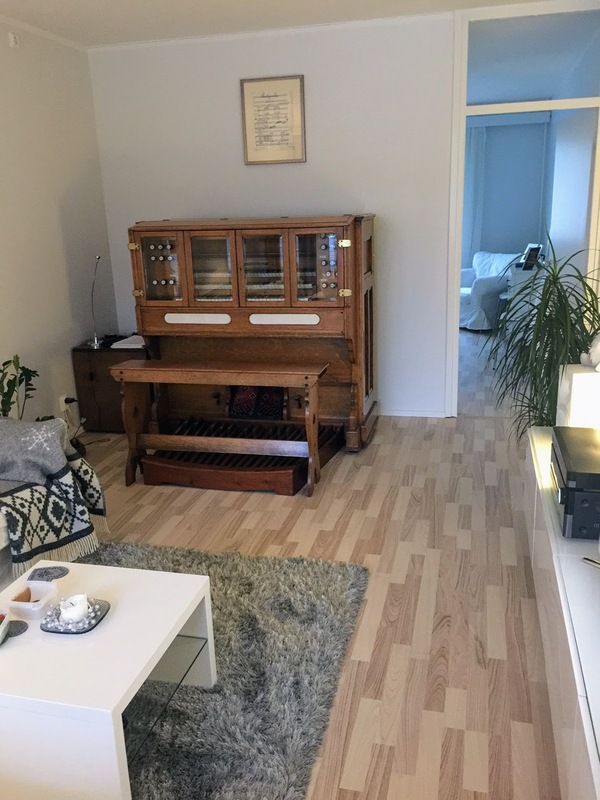 Contact: Gene Johnson Facebook Reed Organ Tech or email. 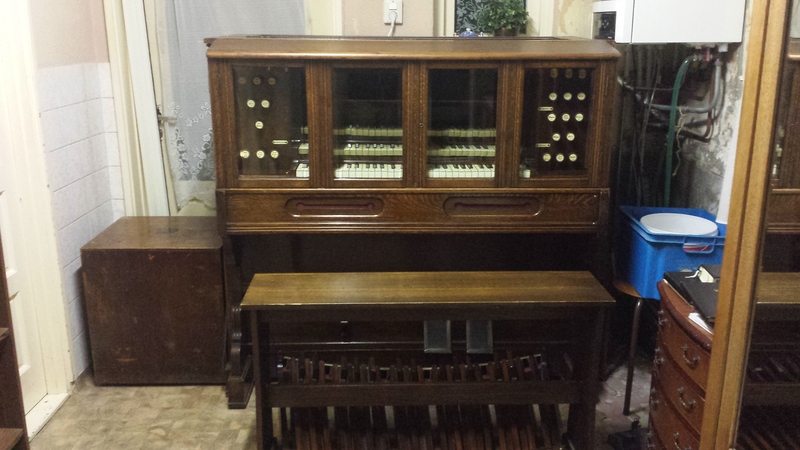 Made by the Dominion Organ and Piano Company ltd, Bowmanville, Ontario, Canada. It is patented and Mouseproof! Bought for me in the early 1970s from an antiques shop in Bath. 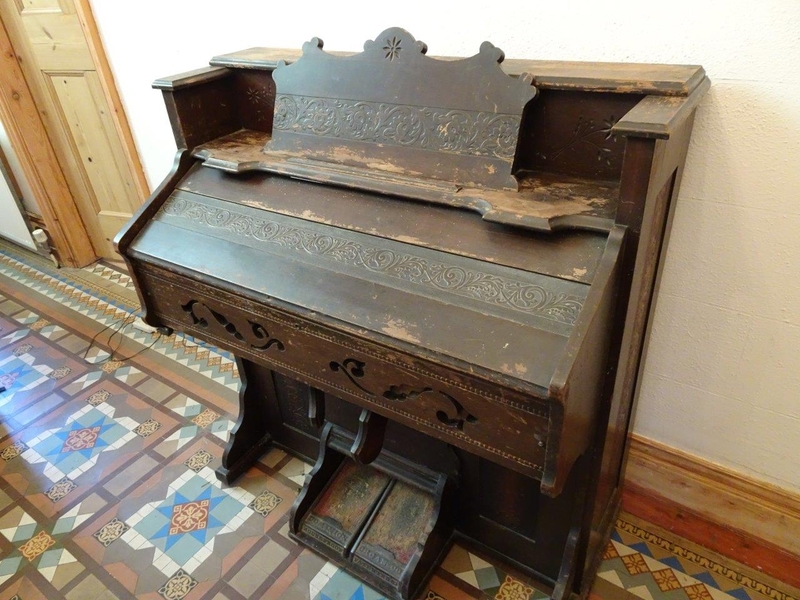 It plays, but could do with some restoration. II Forte, Treble Coupler, Vox Celeste, Echo and Melodia. However 4 of the stop labels are missing and the II Forte doesn’t seem to be connected. There are two knee swells. Ideally I’m looking for someone to take it on and look after it for the next stage in its life. It is located in Nottingham. 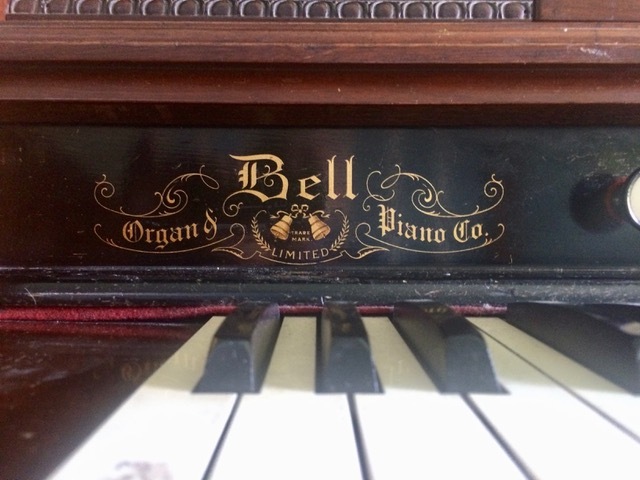 The Bell company, of Guelph, Ont., used the name 'Bell Organ & Piano Company’ from 1880 to 1907. In working condition, except that the right pedal has become detached from its hinges. 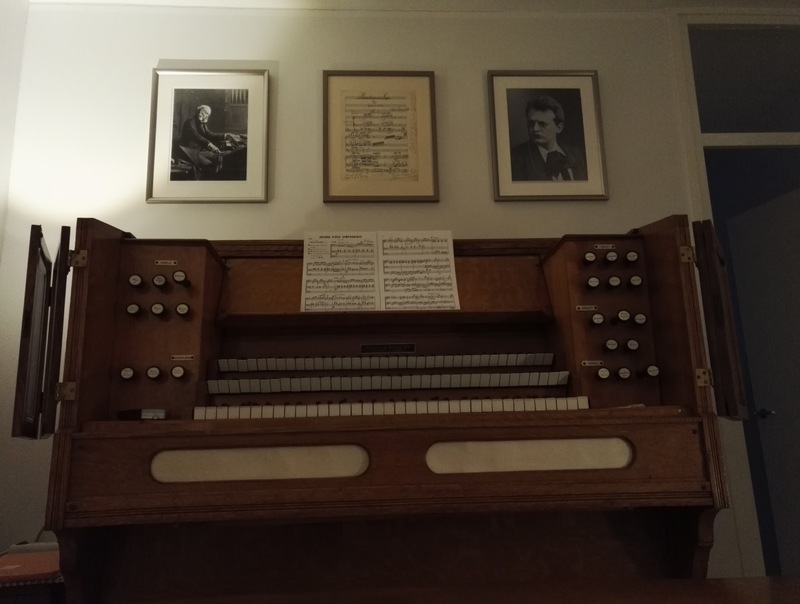 Melodia 8, Echo 8, Celeste 8.
when it was moved to the home of the current owner, also in Edinburgh. Free to the person who collects it or arranges transport. 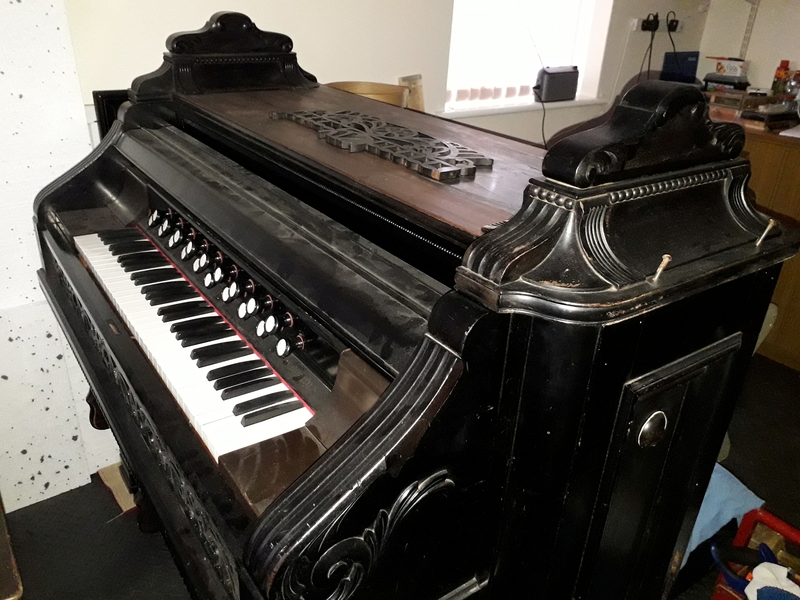 There is also a top part which is currently sitting on the organ which you can't see with a large mirror in the centre and doors on both sides. Located on the Isle of Man. Offers to Sarah by email or anyone with questions can contact Dave on 07624 481958. 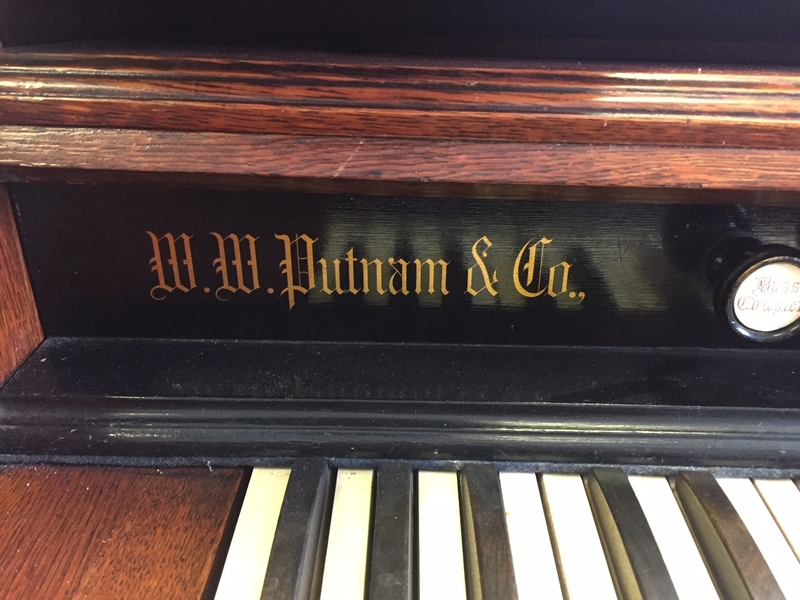 1902 Putnam & Co Reed organ in very good condition with lovely embossed case. Dimensions 113 cm high, 110cm wide, 58cm deep. Located in Exeter, but could possibly deliver at cost of 50p per mile. Contact Paul by email or phone 07836 634071 for further details. 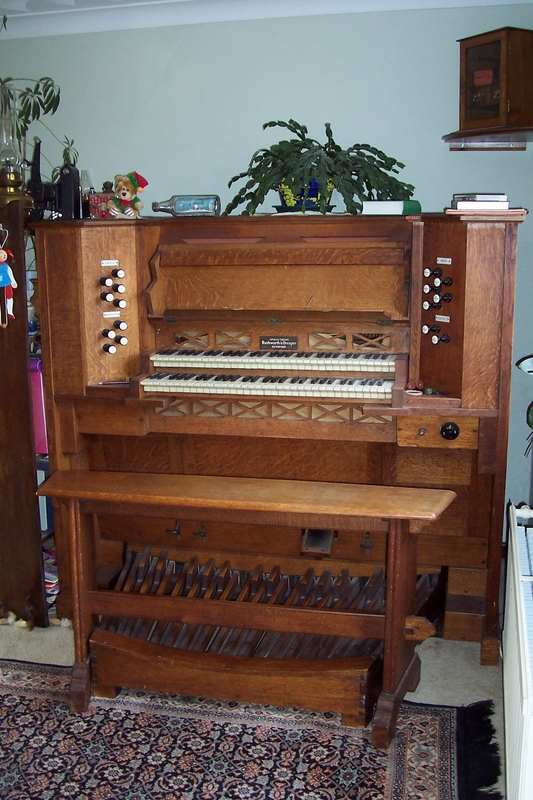 Organ made by Karn of Woodstock Canada. so in need of some loving care. 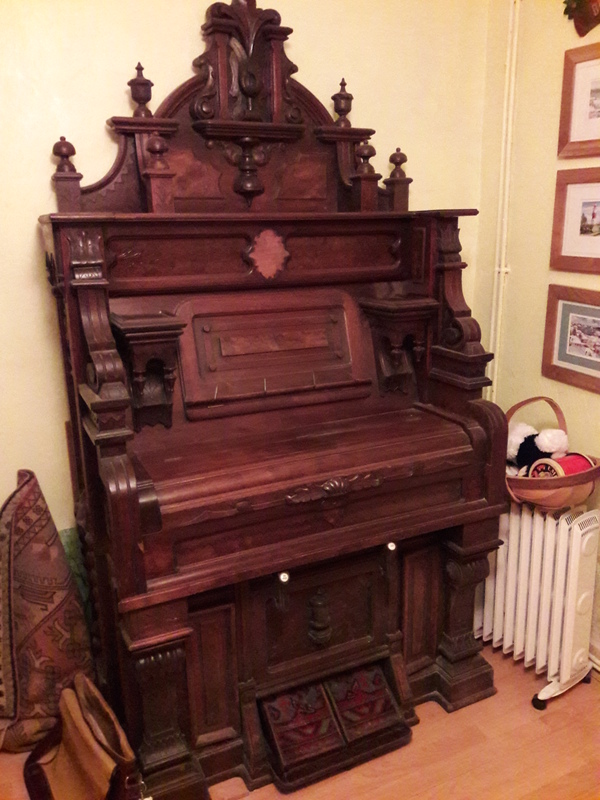 Has been in the family since 1938 when it was purchased by my grandfather. 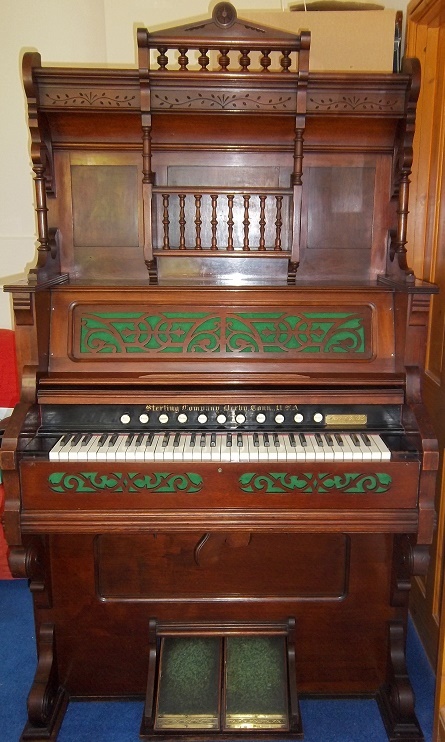 For Sale a Doherty Cinderella Organ circa 1900. Supplied by Crane & Sons Liverpool. Bass.. Diapason, Dulciana (Soft), Principle Forte, Bass Coupler. Bit of trim missing between the pedals. 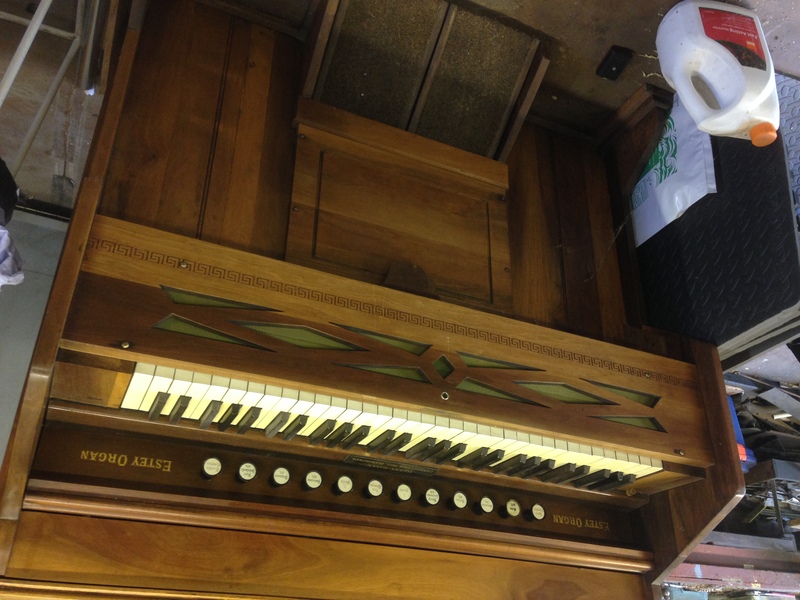 An American reed organ by Estey of Vermont which has been restored by our late father. 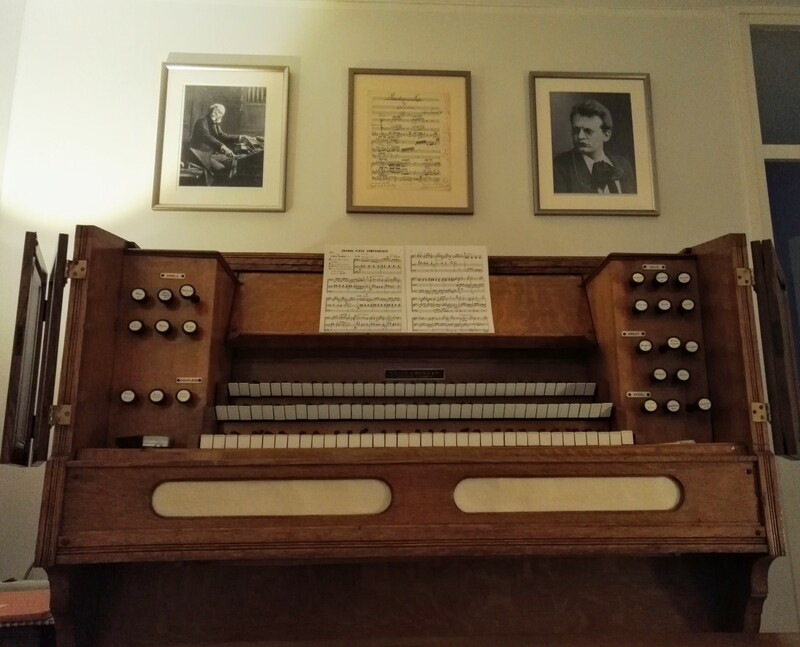 However as we have no knowledge of the workings of the organ, we are unsure whether it still requires some work. 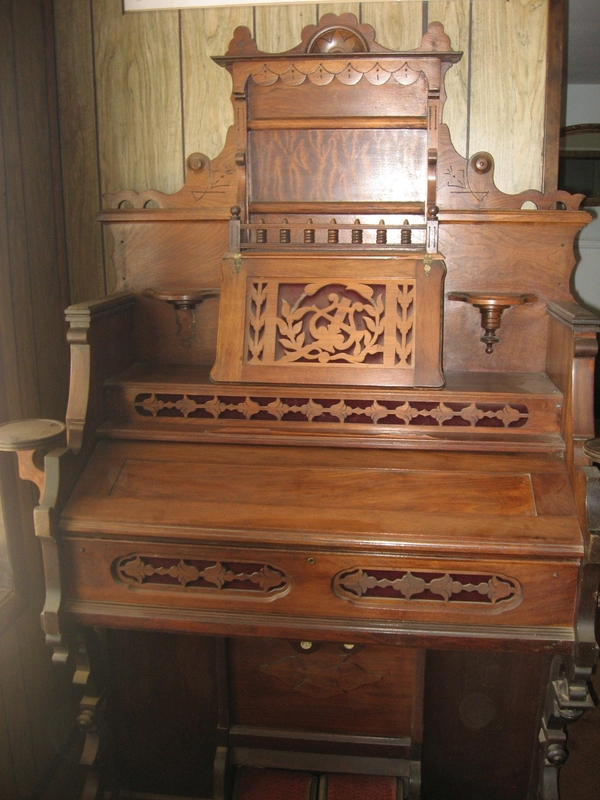 Measurements are 44” long, 42” high, 21” deep. 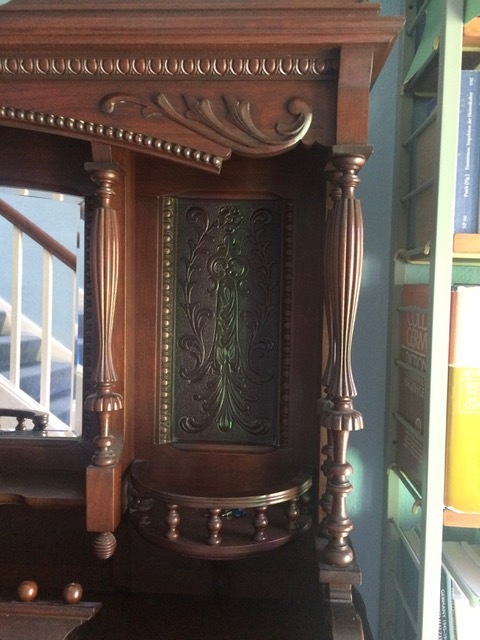 With ten stops and in a walnut case. Looking for small, portable, one to two stops (1-1/2 fine too! 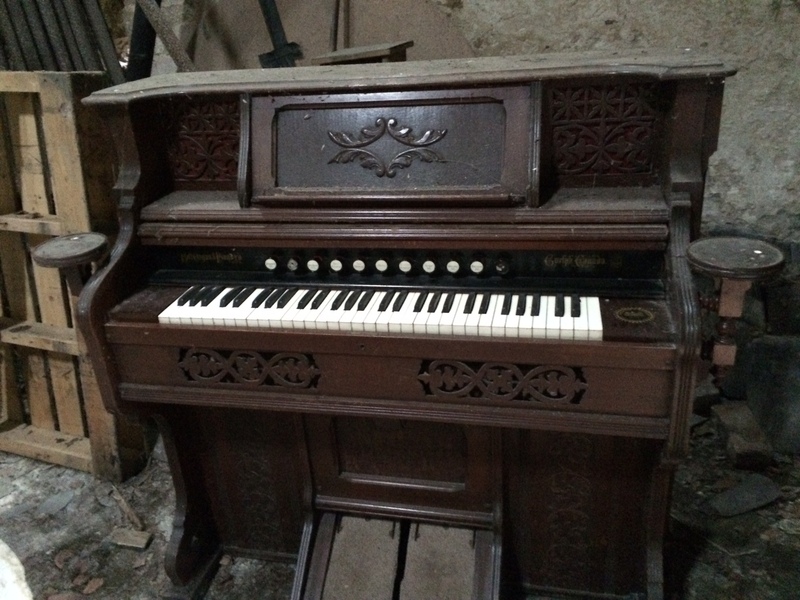 ), wind pressure harmonium/reed organ. Not interested in suction types and folding suitcase/box types (unless it's a windpressure harmonium!). 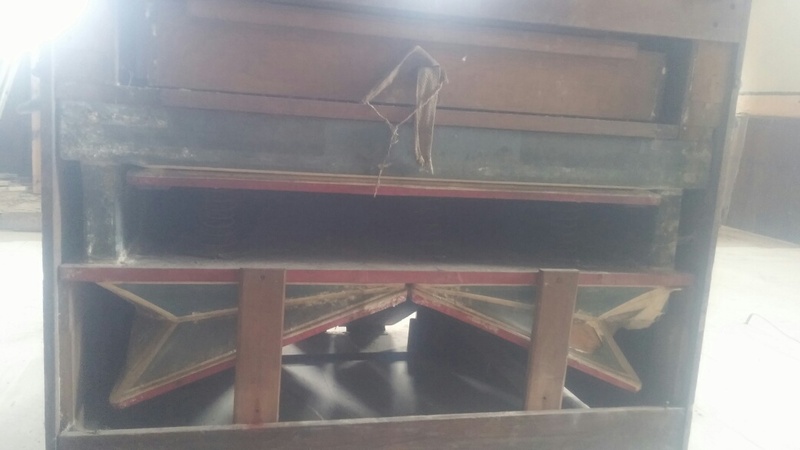 Belgrade, Serbia based buyer will have it moved by an international shipping company. 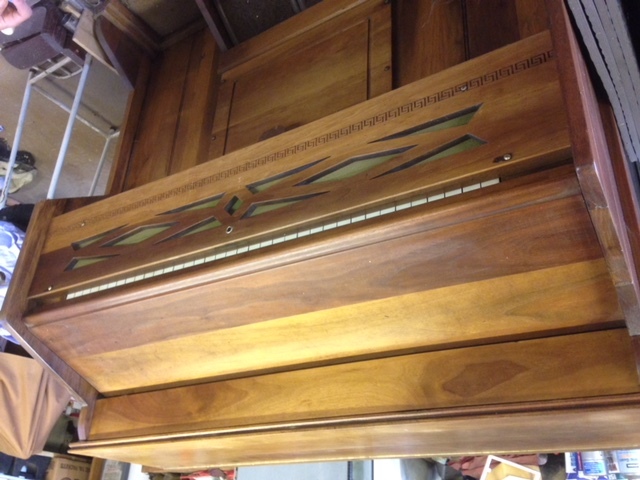 An 1890’s Schoninger American reed Organ in an American Walnut case. 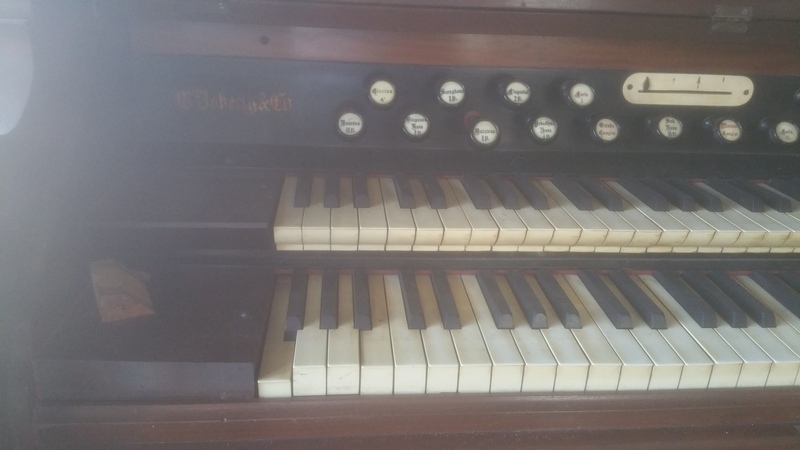 It has 2 ranks of reeds, tremulant, sub base in last octave, coupler, and a set of bells. 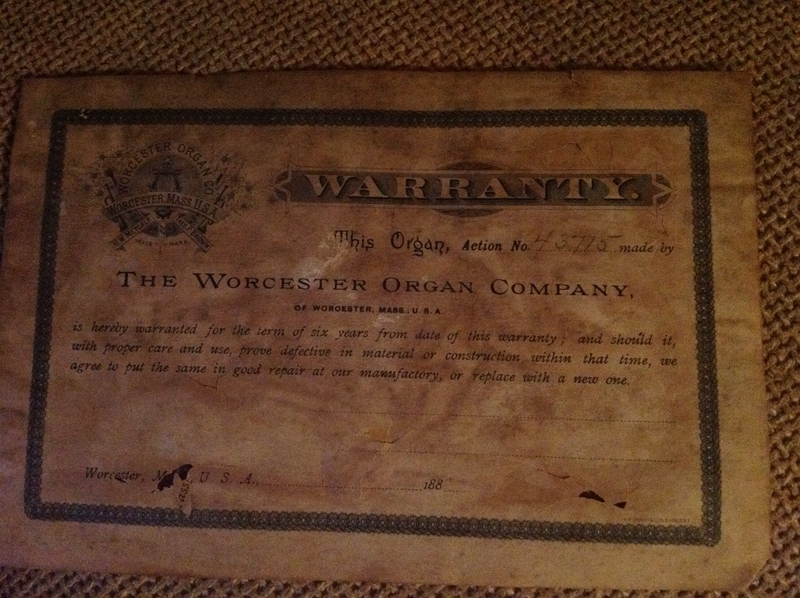 The organ was made around 1890 and all the medals and paperwork are intact. 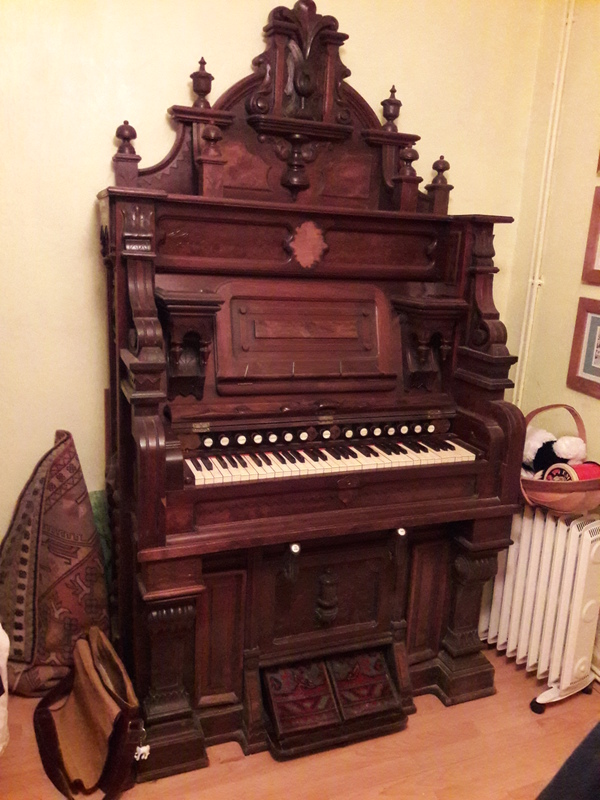 This is the only organ of this make with the set of bells. have come unstuck over time, but all the pieces have been kept. £100 or free to a proven good home. but ‘J & P Schiedmayer internally. Magnificent burr walnut case and tuned to concert pitch. Powerful basses and well-differentiated tone colours. All working nicely, and had had a very easy life. Forced downsizing means she needs a good new home. 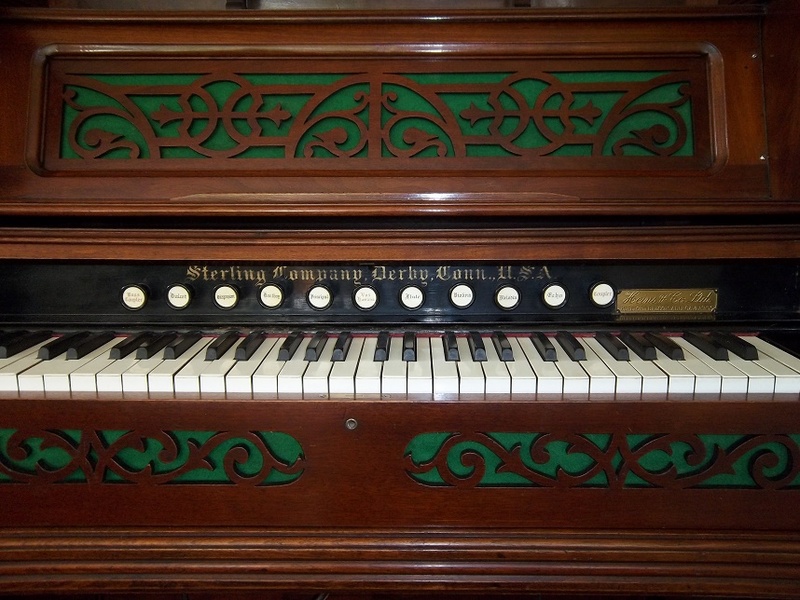 Solid and handsome Victorian Reed Organ, made by the Sterling Company, Connecticut, USA. 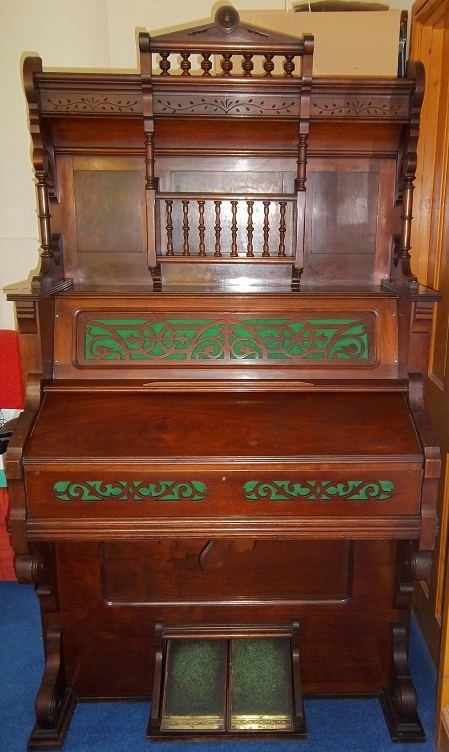 Sold by Heins & Co of Hereford, Brecon & Abergavenny. Number 62150. Based on known Sterling production, this would be about 1892. 36 white notes, 25 black, 11 stops, plus knee swells and foot pedals. Stops (left to right): Bass Coupler, Dulcet, Diapason, Hautboy, Principal, Vox Humana, Flute, Violina, Melodia, Echo, Coupler. candlestands attached beyond each end of the keyboard, which are missing. Collect from near Bridgwater in Somerset, UK. the main body without the top is 49 inches high x 47 wide x 23 deep. 5 Musette; Celeste; Forte; Forte 3 et 4. 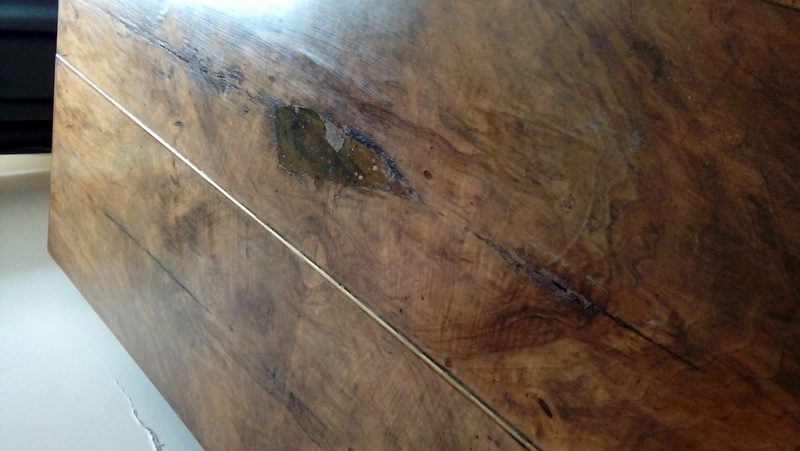 All in working order, but top of case has historic blemishes (see photo). Woodworm in case was treated 20 years ago. Dimensions: w 130cm, d 68cm, h 100cm (lid shut). Heavy item - buyer to collect. Location: Loftus, Saltburn by the Sea. Price £325 cash on collection please. 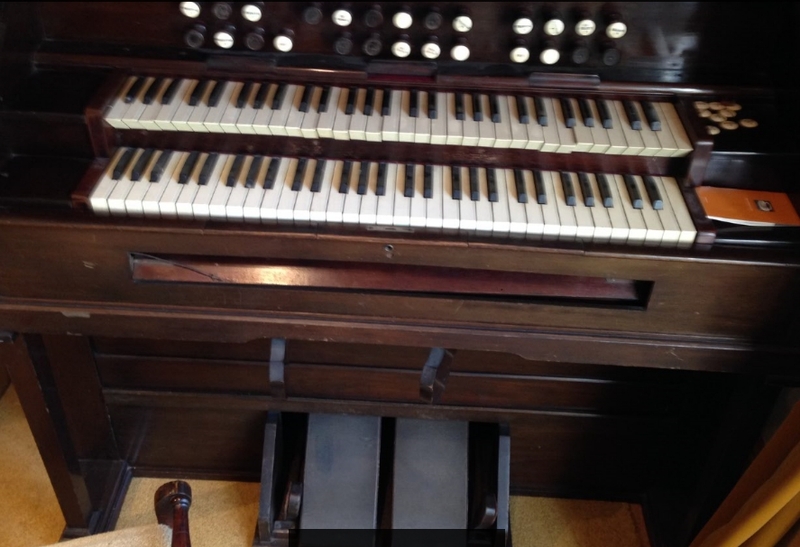 which is connected by a flexible 4 inch diameter hose to the organ. There are 13 different stops and a knee operated lever, which increases the volume. 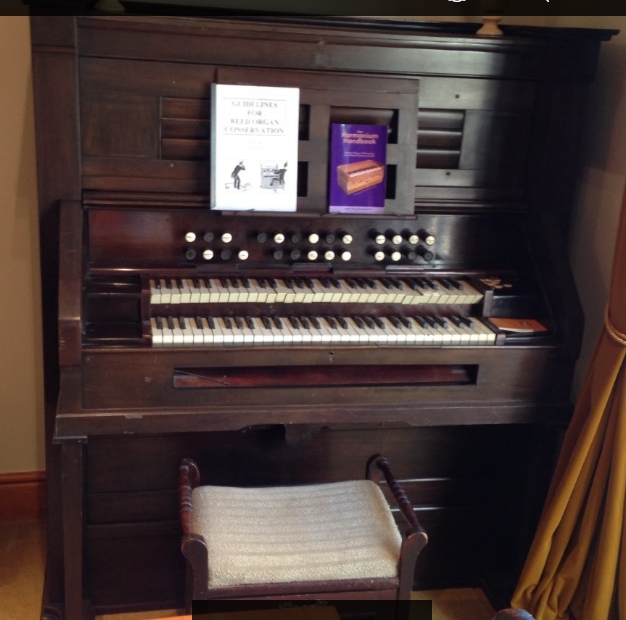 The organ is located in South Worcestershire, near Jct 2 of M50 motorway. 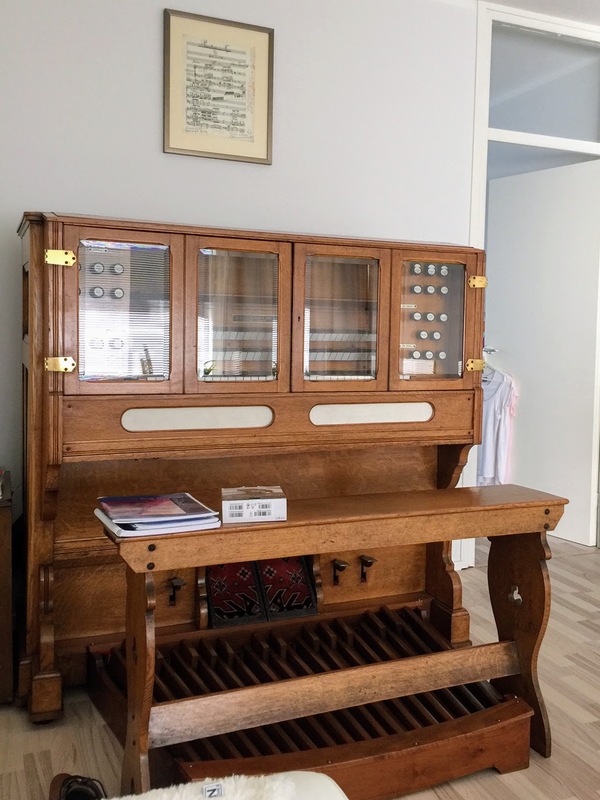 I am happy to give this organ to a collector who must arrange collection and removal. 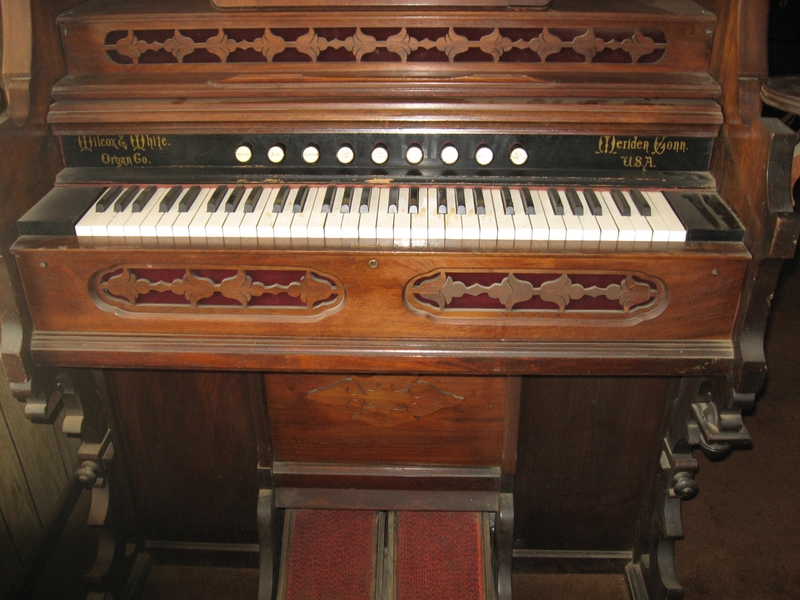 A working but rather battered harmonium that I hope will give another family as much fun as it has given us. We are in South Wales, in Swansea. 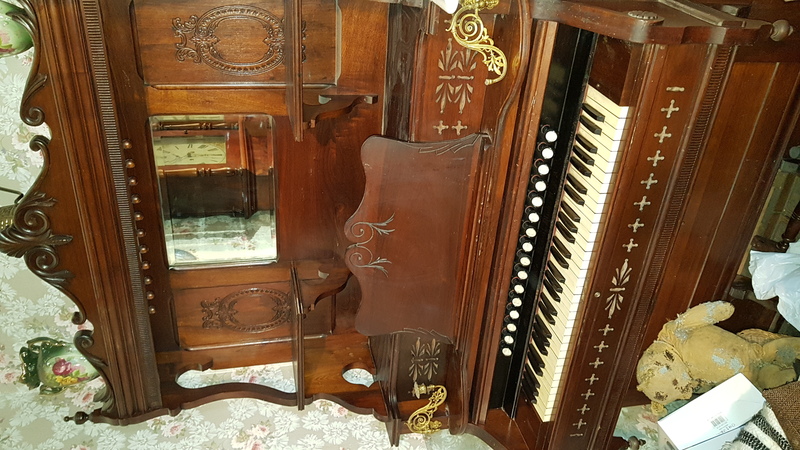 The harmonium came from New York and has the date 1860 inside. 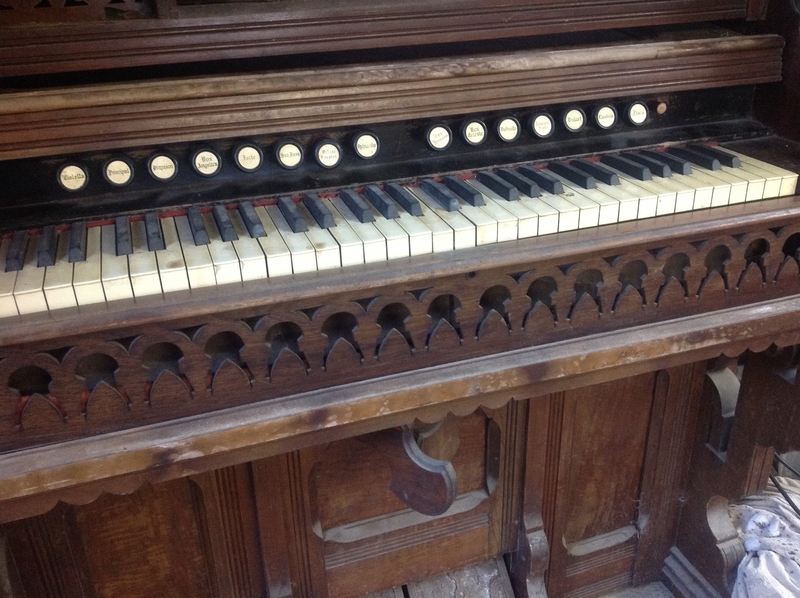 It was the chapel instrument at our local place of worship until it sadly closed twenty years ago. 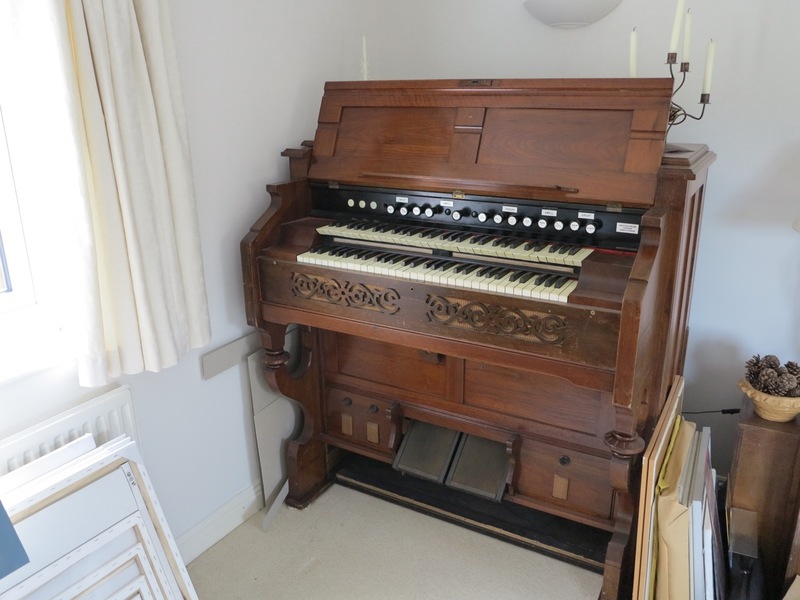 I rescued it and we have all thoroughly enjoyed playing it, but it is simply taking up too much room now. 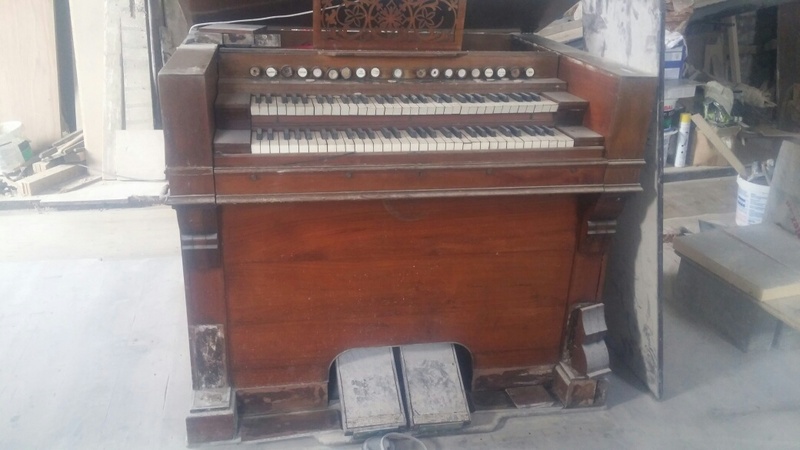 Organ does work but seems to be missing some decorated wood around the top. Might be able to drop off if fuel costs are met. 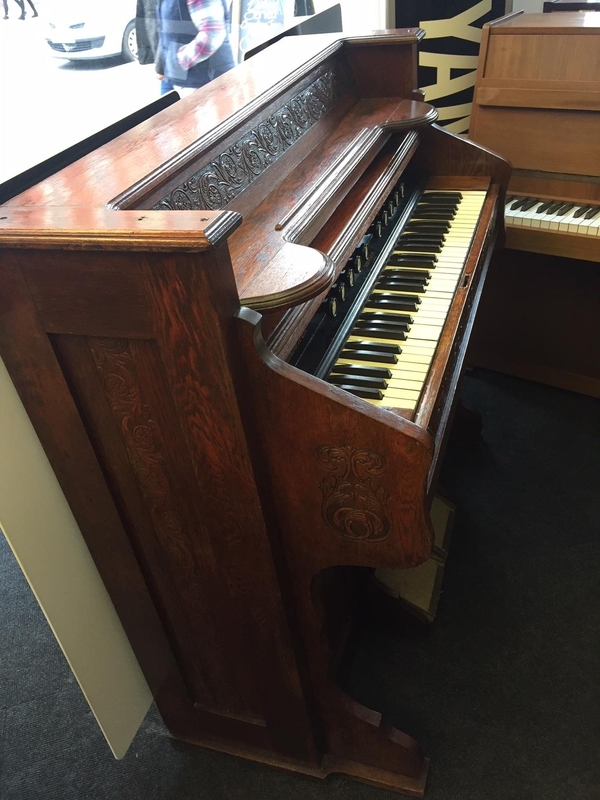 Single keyboard pump organ - made by Mason & Hamlin Organ Company. The dimensions are 131 cm wide, 60 deep and 101 high (in imperial 4'3" x 2'1" x 3'31/2"). 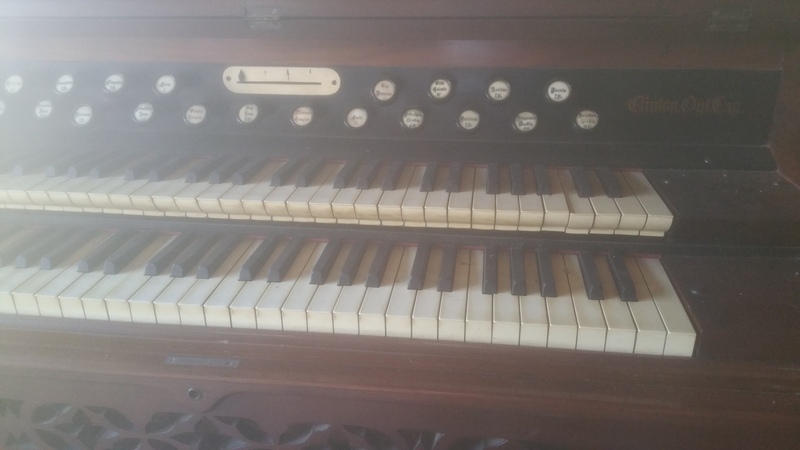 It is actually an organ I believe (blowing out rather than sucking in). by the owner's grandmother and then used mostly as a plant holder for 20 years. but it definitely needs some TLC. 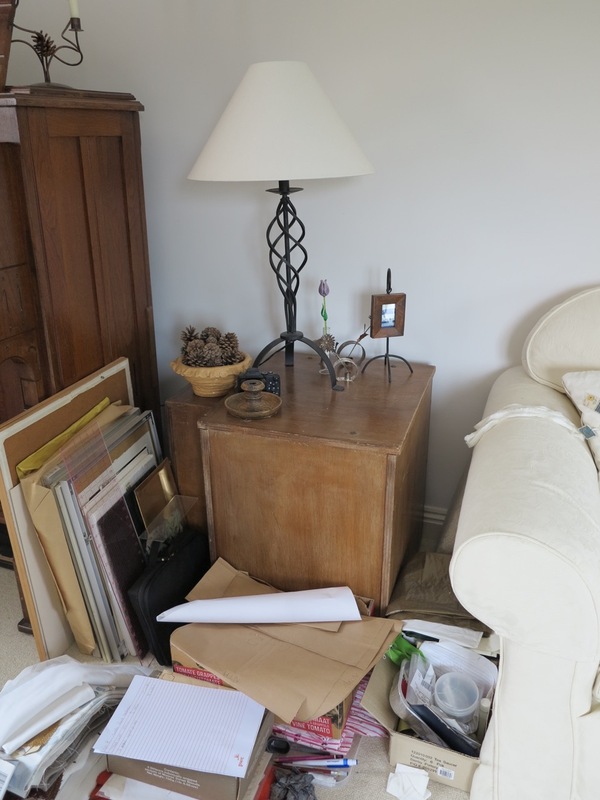 Buyer must collect or arrange collection from SE14, South London as soon as possible. 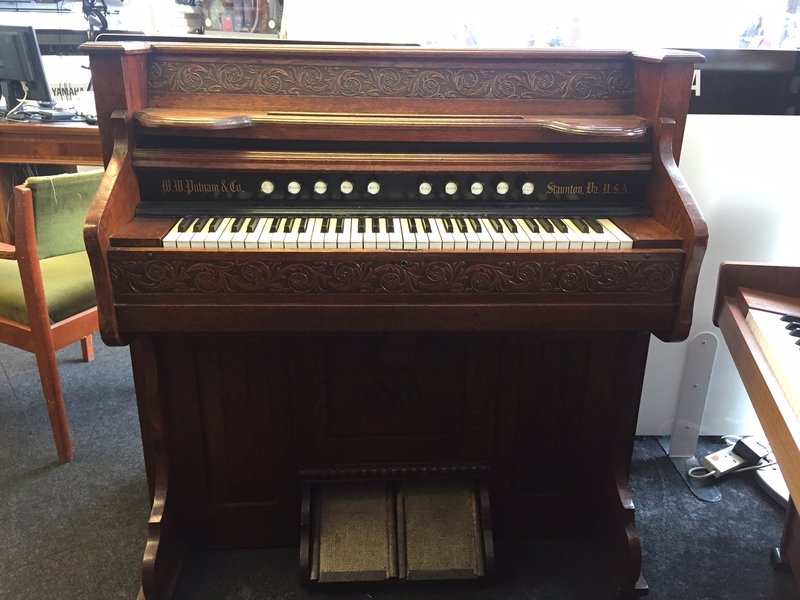 George Woods reed organ £75. Diapason, Viola, Sub Bass, Octive Coupler, Tremolo, Forte, Altoline, Vox Humana, Flute, Melodia. Has quite a flamboyant case with bifolding keyboard cover. 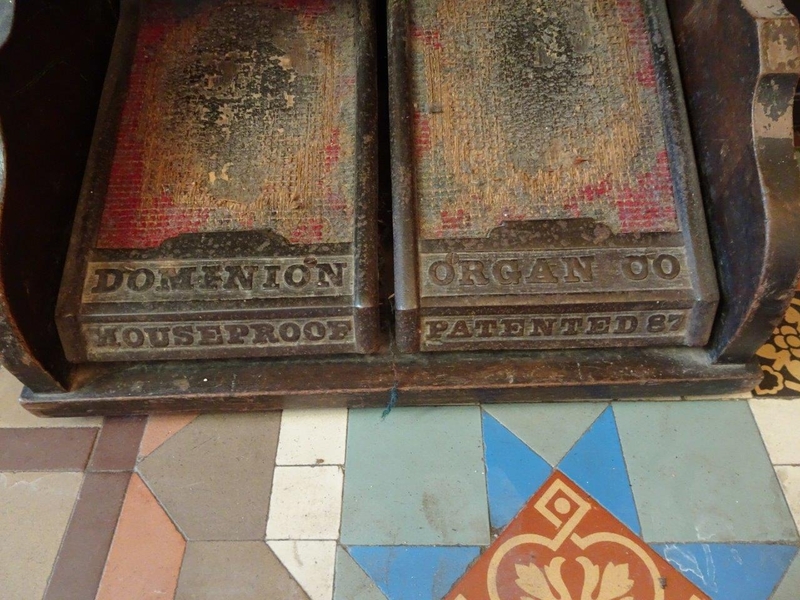 The organ is used daily with a good vacuum system, however probably deserves a little restoration. Still very playable "as is". Located 8 miles south of Preston, Lancashire, PR6 7LZ. 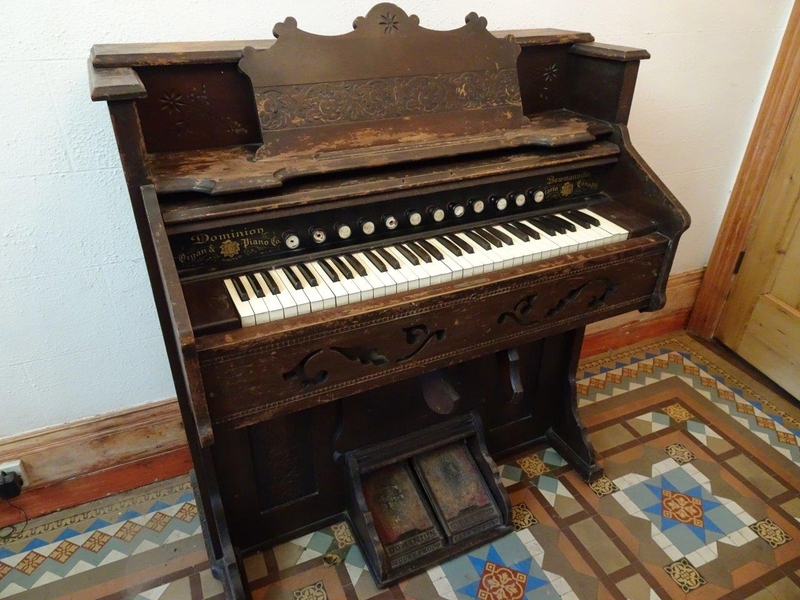 Rare opportunity to purchase a two manual harmonium presently located in North Wales. 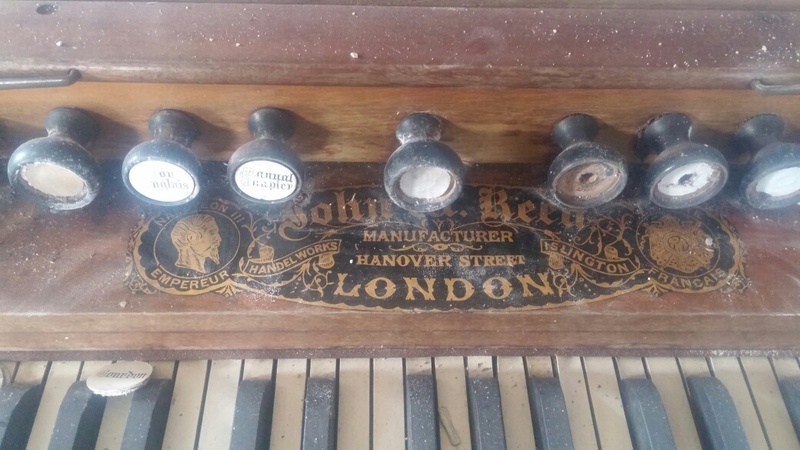 Made by John W Reed in London according to the label. 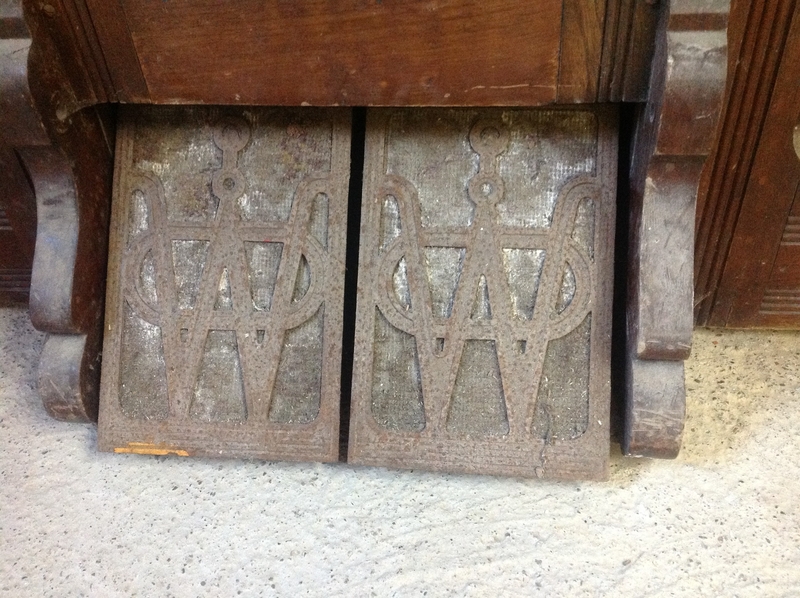 Dimensions: approximately width 48" height 41" and depth 37". Fairly easy access to road. Some help with dismantling and loading possible. No obvious sign of woodworm. 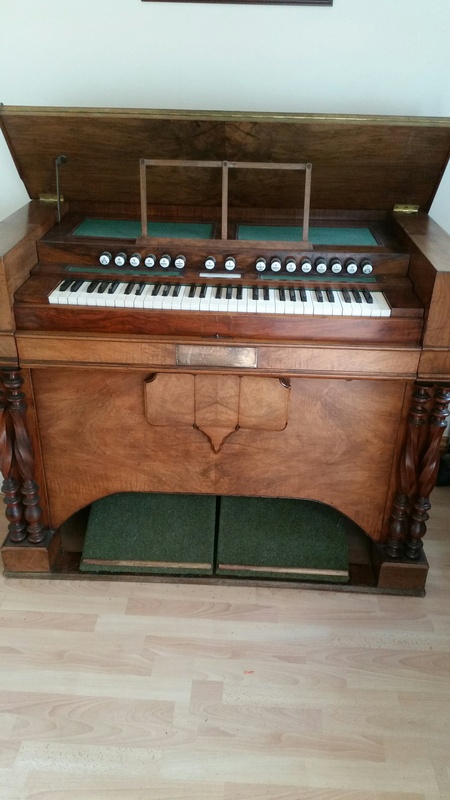 Functional portable pedal organ, or harmonium for UK based working musician. although a good dust would do most of it! 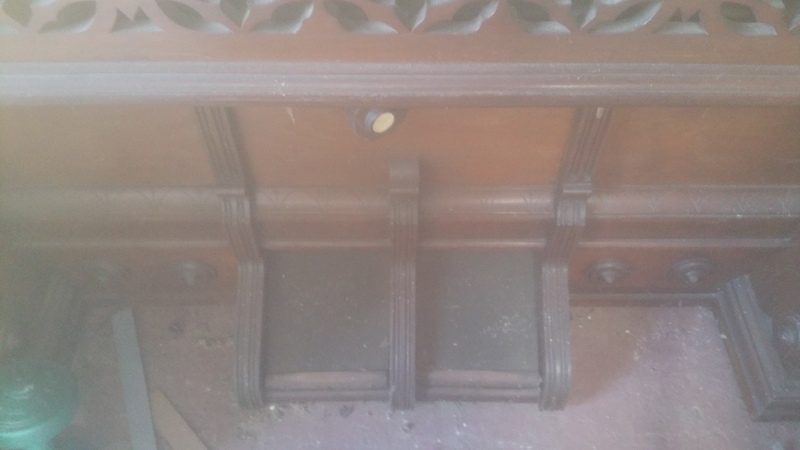 Still has its candle holders and the fretwork looks complete. 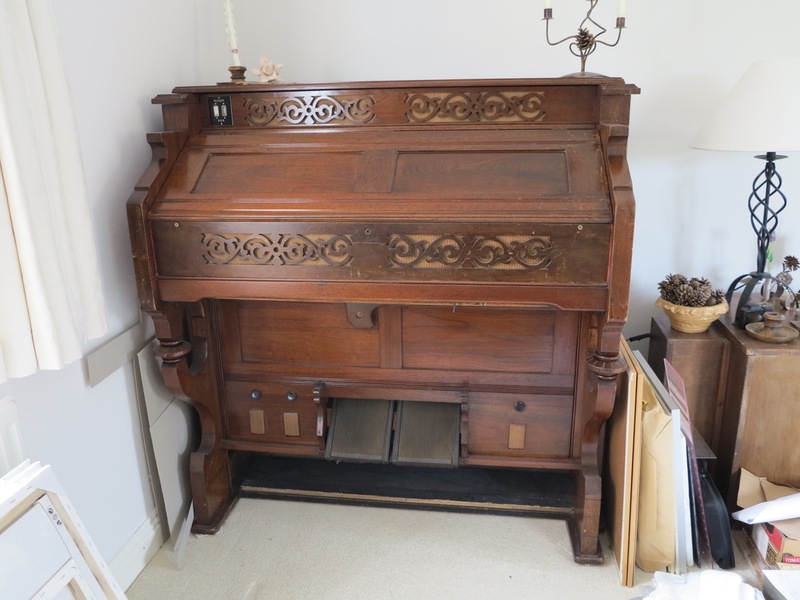 It is a "Parlour Organ" - also known as a "Chapel Organ". Manufactured by J Humphreys & Son of Drummond Street, Euston Square, London UK. "I bought it many years ago with a view to bringing it to pristine condition but never had the time. 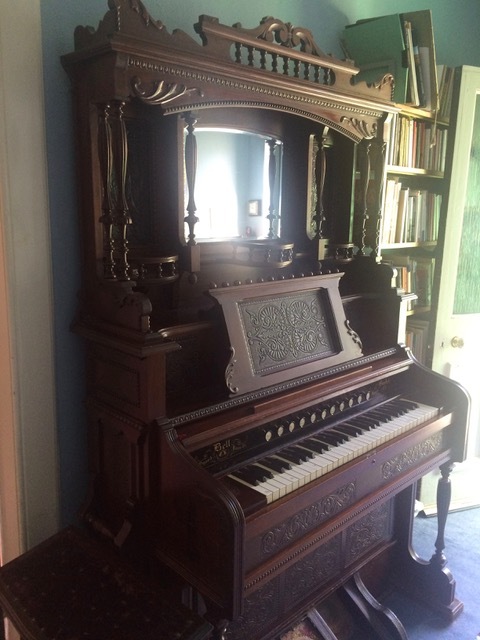 It is functional and plays reasonably well." gap, Principal 4, Diapason 8, Vox Celeste 8, Bourdon 16. It is located in North Lincolnshire in the UK and all I ask for is a nominal £20 and buyer collects. 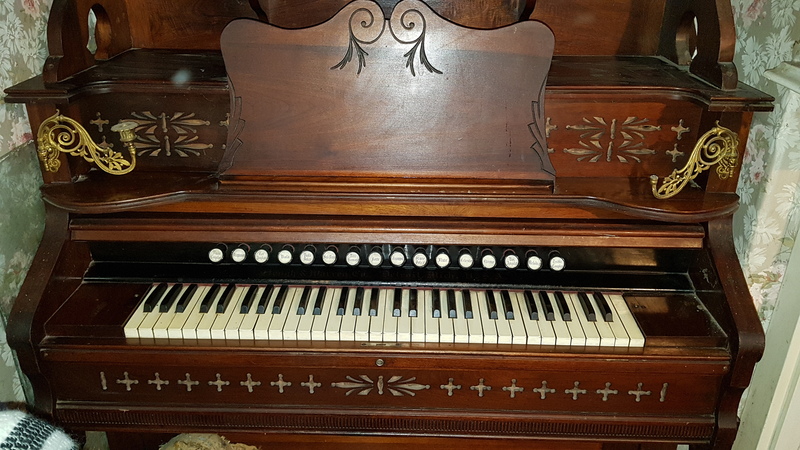 Suction reed organ built in 1928/1929 by A.J. Spencer Manchester, UK. plus the original wind supply is still present and in working order. (A lever on the right side). 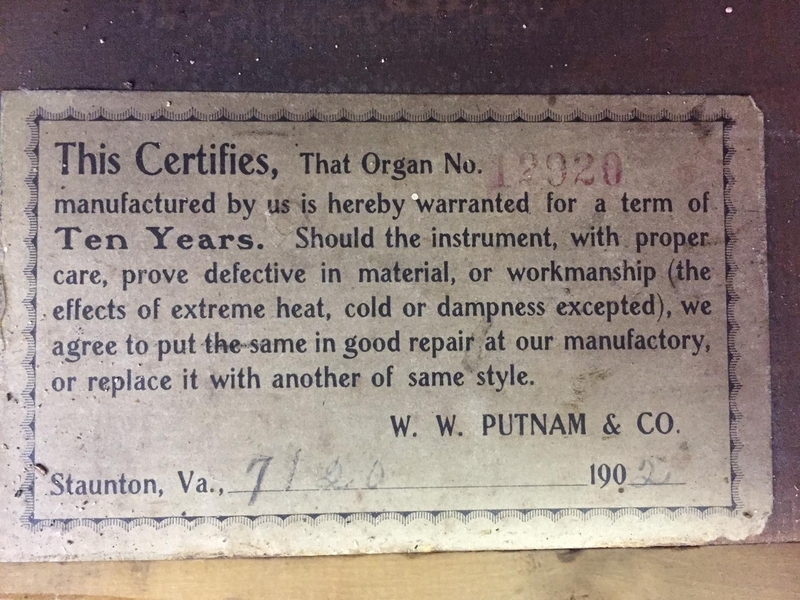 The organ is in a correct, reasonable, and playable, state but deserves to be properly checked and cleaned! Violetta 4 'Cremona 8' Seraphone 8 'Clarionet 16' Forte Tremolo. Manual 2. (SWELL). Flute 4' Oboe 8' Voix Celeste 8' Salicional 8' Forte 2 Vox Humana. .....thought to be previously owned by the band Supergrass. In need of attention, but everything seem to be there....just needs a bit of TLC! The upper part (26 inches high) can be removed for transport. Has been in the family for 5-10 years. Needs work on some of the stops. 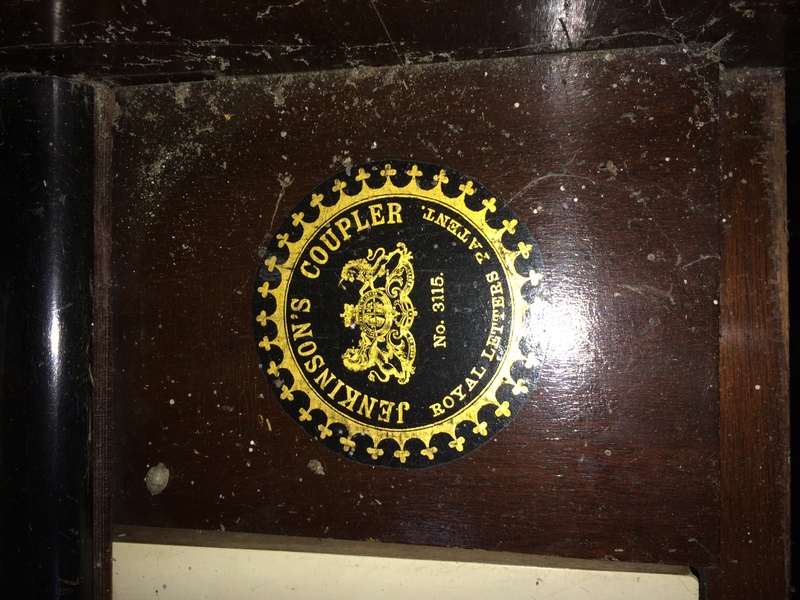 It is free to the collector, from Southampton. Contact Josh for further details.